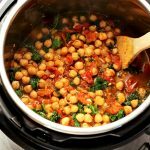 Healthy and Hearty Instant Pot Chickpea Stew, made with few ingredients and a whole lot of flavor! The next day, drain and rinse chickpeas. Add to instant pot. Also add cans of diced tomato sauce and give it a quick stir. Cover the Instant pot and turn venting valve into lock position. Cook on high pressure for 16 minutes. When done, allow for natural pressure release (NPL). When all pressure has been release, unlock the lid open and add chopped kale. Season with salt and pepper to taste and finally add in red pepper flakes. Stir to combine, make sure the kale is submersed. Place cover back on and let it sit for 5 minutes before serving.